How Does a 110-Million-Year-Old Dinosaur Still Have Its Skin? 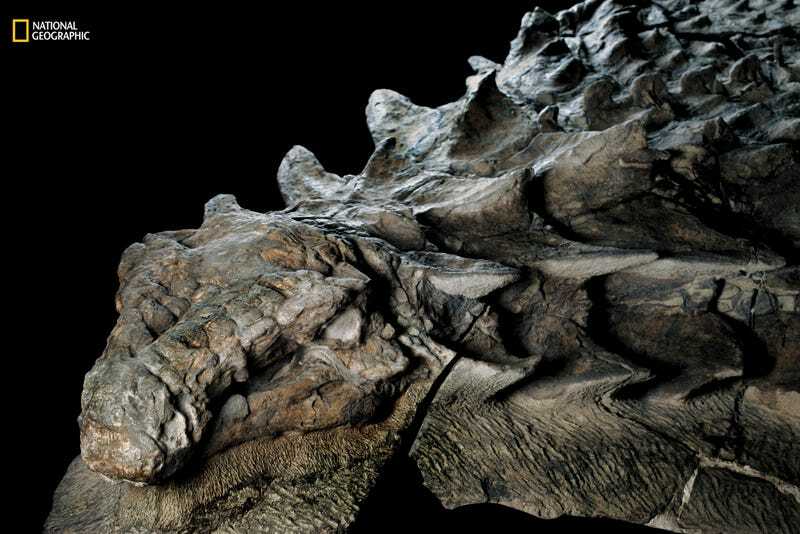 An arresting image of a “mummified” dinosaur went viral this weekend after National Geographic broke the story of the 110-million-year-old armored plant-eater, a newfound species of nodosaur whose exquisite remains are now on display in the Royal Tyrrell Museum in Alberta, Canada. The ancient animal is obviously a remarkable specimen—not just a few battered bones, but an entire creature, transformed into stone with bits of the original soft tissue still preserved. When I first saw images of the beast, which was photographed for the June issue of National Geographic, I had to know how it came to be so well-preserved—and if there are other dino mummies like it. So I called up Caleb Brown, one of the paleontologists who has been studying the fossil since it was first unearthed from the Alberta Tar Sands in 2011. He was quick to emphasize just how special this specimen was. Brown added that while his team can’t see the skeleton—because it’s beneath hundreds of pounds of petrified dinosaur flesh—they are currently using CT scanning to analyze the innards as much as possible. “We might eventually be able to tell a bit about its internal organs, even its last meal,” he said. So, how does a massive lump of flesh manage to elude decomposition for 110 million years, last meal and all? Obviously, we can’t turn back the clock and find out. But knowledge of the environment that the nodosaur lived and died in has allowed Brown and his colleagues to reconstruct a likely scenario. According to Brown, back in the early- to mid-Cretaceous, Alberta would have been a very different place. “A large, inland sea stretched from the Gulf of Mexico to the Arctic Ocean—very warm, and very shallow. Most of the dinosaurs we find are preserved near the coast,” where big river systems sent loads of sediment rushing into that inland ocean, trapping and fossilizing bits of ancient animals that died along the way. But this dead dino wasn’t found along a coastline, where it would have munched leafy greens in an environment similar to the Florida Everglades. It was found offshore, at the bottom of an ancient sea bed. “The animal was preserved in an environment it didn’t live in,” Brown said. “It would have been living on land, and washed out to sea,” probably after it died. By the time the armored carcass arrived in the ocean, the decomposition process would have begun—trillions of bacteria breaking down its cells and releasing noxious gases. Its body would have started to inflate like a great, stinky flesh balloon, buoying it along on the warm shallow sea. Bloat and float, marine biologists call it. The putrid hot pocket would continued on its merry way, until eventually, something caused it to explode. After smashing unceremoniously into the seafloor, the deflated nodosaur was probably buried under a thick layer of mud, protecting it from scavengers. Low oxygen levels at the bottom of the ocean could have also impeded decomposition. Eventually, the beast became petrified through and through, hard minerals replacing its squishy soft tissues. Although according to Brown, the soft bits don’t seem to be entirely gone. And as for whether there are other dino mummies out there, waiting to be unearthed from the ancient seas? Brown emphasized that the conditions which led to this nodosaur becoming petrified whole are extremely unusual. More unusual still is humans happening to stick their shovels in precisely the right spot to find such a creature. But he doesn’t doubt there are more petrified beasts of the Cretaceous out there, swallowed whole by the Earth by some strange combination of death and physics.